Karnataka: In a shocking incident, CCTV footage of a private hospital in Karwar in Uttara Kannada district of Karnataka, has revealed the Karnataka BJP MP and his supporters beating medical practitioners for failing to attend to his mother on time. The incident goes back to Monday, when BJP MP Anant Kumar Hegde, brought his mother to TSS Hospital in Sirsi, after she fractured her leg due to a fall. As the doctors were busy in the Operation theatre, the MP had to wait for treatment for a while. Running out of patience, the MP resorted to shouting and soon violence while talking to the doctors. 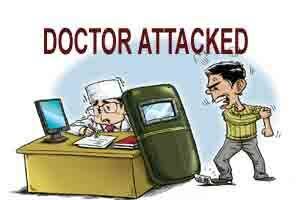 The three doctors brutally attacked by the MP include Dr Madhukeshwara Jeevi, Dr Balachandra and Dr Rahul Marshakar. TOI reports that MP dragged Dr GV Madhukeshwar out of the ward and thrashed and kicked him. When Dr Balachandra Bhat and employee Rahul Musharkar tried to save Madhukeshwar, the MP assaulted them as well. They suffered injuries and deep cuts on the throat, head and face. CCTV cameras also showed a woman doctor, who tried to save Madhukeshwar, was rudely pushed aside by the MP’s associate. Further the daily adds that when the doctors tried to file a complaint against the MP, they were threatened with a counter complaint. Speaking to The Hindu later over phone, Dr. Madhukeshwar said they decided not to pursue the case as Mr. Hegde had apologised for his action. “But we are deeply hurt as we were manhandled despite doing our duty. We only hope that such incidents do not recur,” he said. Ironically, the news has come to light the same time, when sources at the BJP central government have informed about a central act on violence against doctors coming into existence. It is better to beat them with equal brutality so they can have a taste of it rascals. This is the test for Prime minister Modi to act or else he looses my support. I am.an ardent supporter. He may care two hoots about my support but I shall wait to see some action taken. This man brought shame to BJP and Modiji.If the party has the moral fibre and spine,the MP should be sacked forthwith,or else the party is of the same ilk as any other.